This story could correctly be entitled, “Cycles.” For most of the 20th Century and the first decade and a half of the 21st, we’ve watched this cycle occur in our foreign and defense policies. It began with Wilson, continued with FDR, Carter, Clinton and now Obama. Each iteration of liberal polices led to disaster. It always seem to require a conservative administration to put our house back in order…until the next liberal administration betrays us once again. For a time, reset, concessions and appeasement work to delay wars. But finally, nations wake up, grasp their blunders, rearm and face down enemies. That gets dangerous. The shocked aggressors cannot quite believe that their targets are suddenly serious and willing to punch back. Usually, the bullies foolishly press aggression, and war breaks out. It was insane of Nazi Germany and its Axis partners to even imagine that they could defeat the Allied trio of Imperial Britain, the Soviet Union and the United States. Hitler figured that for a decade America had been unarmed and isolationist. Britain repeatedly had appeased the Third Reich. The Soviets initially collaborated with Hitler. Hitler met no opposition after militarizing the Rhineland. He annexed Austria with impunity. He gobbled up Czechoslovakia without opposition. Why shouldn’t Hitler have been stunned in 1939 when exasperated Britain and France finally declared war over his invasion of distant Poland? Six years of war and some 60 million dead followed, re-establishing what should have been the obvious fact that democracies would not quite commit suicide. By 1979, the Jimmy Carter administration had drastically cut the defense budget. President Carter promised that he would make human rights govern American foreign policy. It sounded great to Americans after Vietnam — and even greater to America’s enemies. Then Iran imploded. The American embassy in Tehran was stormed. Diplomats were taken hostage. Radical Islamic terrorism spread throughout the Middle East. Communist insurrection followed throughout Central America. The Soviet Union invaded Afghanistan. China went into Vietnam. Dictators such as the Soviet Union’s Leonid Brezhnev and Iran’s Ayatollah Ruhollah Khomeini assumed that Mr. Carter no longer was willing to protect the U.S. postwar order. Or perhaps they figured that the inexperienced American president was too weak to respond even had he wished to do so. Then, Ronald Reagan defeated Mr. Carter in 1980 on the promise of restoring U.S. power. At first, both America’s friends and enemies were aghast at Reagan’s simplistic worldview that free markets were better than communism, that democracy was superior to dictatorship, and that in the ensuing struggle, the West would win and the rest would lose. Foreign media damned Reagan as a warmonger for beefing up the U.S. defense budget, reassuring America’s allies and going after terrorists with military force. The column continues onto a second page with Hanson’s analysis of Obama. The pattern is well established. Liberal, i.e., democrat administrations, weaken the nation, creates choas within our military with massive cuts and misappropriation of funds, thus allowing our enemies to become emboldened. The problems resist until a conservative administration is elected to fix the problems the liberals have created. The Obama foreign policy cannot continue much longer without provoking even more chaos or a large war. Yet correcting it will be nearly as dangerous. Jumping off the global tiger is dangerous, but climbing back on will seem riskier. Here is an item where the ACLU and Missouri conservatives agree. The use of ‘StingRay’ technology should be banned within the state. The St Louis Post Dispatch published this editorial on Wednesday. Last summer, as the American Civil Liberties Union was standing side-by-side with Missouri Republicans supporting the passage of a constitutional amendment that sought to protect “electronic communication and data” from unreasonable search and seizure, the St. Louis Metropolitan Police Department was sitting on a secret. In cooperation with the FBI, the St. Louis police had been using a cellphone tracking device known generically by the brand name of one such device: StingRay. The high-tech gadgets allow police to mimic a cell tower. They screen and track nearby digital data, determining the specific location in a building, for instance, of the cell phone they are tracking. Last month, as first reported by the Post-Dispatch’s Robert Patrick, prosecutors dropped more than a dozen charges against three defendants in a case where the technology was employed. Defense attorneys believe the charges were dropped because police don’t want to reveal details about their new high-tech toy. But in Missouri, there may be a bigger problem. It has to do with that constitutional amendment that the strange bedfellows of the ACLU and Missouri Republicans were promoting. A plain reading of the language of Amendment 9, passed by 75 percent of the voters who turned out on Aug. 5, suggests that it is now unconstitutional in Missouri to use a StingRay device — at least without a warrant that offers significantly more detail about the data being sought. The column continues at the website. As the editorial admits, the Post-Dispatch opposed the passage of Amendment 9 last year. They are reconsidering that opposition now that it appears the St Louis Police Department is actually using StingRay technology in defiance to Federal, and now, Missouri law. My morning and general lack of sleep has upset my routine. I’ve an appointment as well and don’t have the time to spend on my usual lengthy daily posts, I’ll post some links instead. Loss of Liberty and Privacy…the DHS will haunt you. Meet the new BOSS, short for Biometric Optical Surveillance System, a crowd-scanning technology under development for the U.S. Department of Homeland Security. John Boehner is attempting to show some backbone over the coming Continuing Resolution fight. He’ll telling folks he’ll fight to cut Obamacare…in some fashion, in some way. Perhaps having the Tea Party picket his Ohio office had something to do with it…not that anyone really believes Boehner will buck Obama. House Speaker John Boehner said “a whale of a fight” is coming over the debt ceiling, contradicting a prediction by U.S. Treasury Secretary Jack Lew that President Obama will raise the debt limit without negotiating with Congress. “I’ve made it clear that we’re not going to increase the debt limit without cuts and reforms that are greater than the increase in the debt limit,” Boehner told supporters in Idaho, the Idaho Statesman reported. Paul, Cruz and Lee are putting pressure on their RINO colleagues to cut funding for Obamacare. In what tea party groups are calling a “battle to save America from the Obamacare ‘train wreck,’” Republican lawmakers plan to appear at a Capitol Hill rally on Sept. 10 to promote a proposal to defund the Affordable Care Act. Republican senators Rand Paul (Ky.), Mike Lee (Utah) and Ted Cruz (Tex.) will headline the “Exempt America Tour” rally on the West Lawn as a culmination of a five-day tour of six states. The tour, which will kick off in Kentucky on Tuesday, is sponsored by seven tea party groups, including Tea Party Patriots and For America. The tour is the latest effort to pressure Republican lawmakers to take a tougher stance against Obamacare. It comes after a pointed online ad campaign targeting GOP senators who either oppose defunding Obamacare or haven’t yet announced a position. Republican leaders who have been the subject of online ads include House Speaker John Boehner (Ohio) and Sens. Lamar Alexander (Tenn.), Jeff Sessions (Ala.), Tim Scott (S.C.), Thad Cochran (Miss. ), Pat Roberts (Kan.) and Patrick J. Toomey (Pa.). “If these Washington politicians think they can simply go home on summer break and claim they are doing everything they can to get rid of ObamaCare they have another thing coming,” said For America Chairman Brent Bozell in a statement. Y’all have a great day and drop back tomorrow. I’m still upset about the Siege of Boston where various paramilitary organizations suspended the Constitution. They claim “special circumstances.” The last I looked, there was no “special circumstance” that allowed for the suspension of the Bill of Rights. Some Presidents have violated the Bill of Rights. Lincoln suspended Habeas Corpus during the Civil War. Roosevelt did likewise and more during World War II. The FBI, under Hoover and later Directors, has spied on American and violated numerous civil rights as well. All those examples of pass behavior and their acceptance at the time, does NOT make it right nor in many cases, legal. The Constitution, in the 1st Amendment, provides for the freedom to assemble—to gather in groups to express political grievances. Freedom of movement, the right to travel about at will without restriction, is not in the Constitution although it was in the Articles of Confederation, Article 4. Freedom of Movement was not included in the Constitution because the authors felt it wasn’t needed but was a fundamental right recognized by all. The US Constitution provided for Freedom of Travel between states via the Privileges and Immunities Clause. However, the authority to regulate that travel was granted to the states rather than the Federal Government. Travel within the states was deemed to be a state issue according to several SCOTUS decisions. The result of this ambiguity is Boston on April 19, 2013. The rights of the people to assemble, to move about, to openly travel for whatever reason, is limited, according to law. Whatever government grants, the government can take away. We saw this last week in Boston. People were ordered to return to their homes and to remain there. 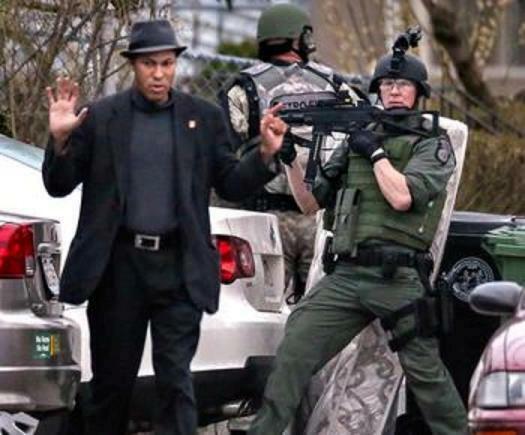 Those who ventured outside risked being detained, restrained at gunpoint as the photos below testify. However, the Constitution, in the 4th Amendment, does say that people have the right to be secure in their homes. That right can only be suspended by a search warrant showing probable cause and to state specifically what is expected to be found. 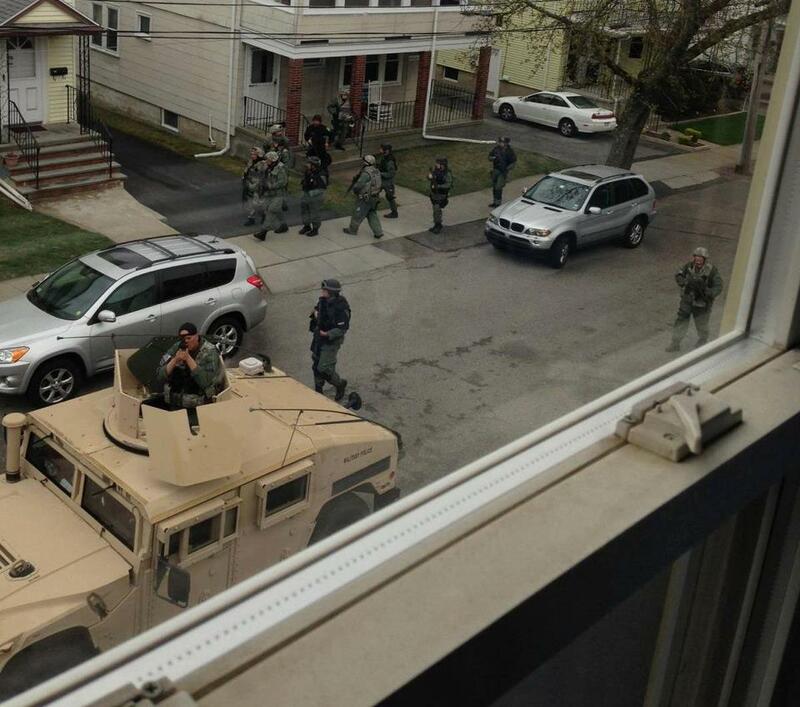 The government forces in Boston did not acquire search warrants. One spokesman said there weren’t sufficient judges available and since they were in “hot pursuit” (four days later!? ), a warrant wasn’t required. People were evicted from their homes, at gun point and without warrants—a violation of the 4th Amendment. 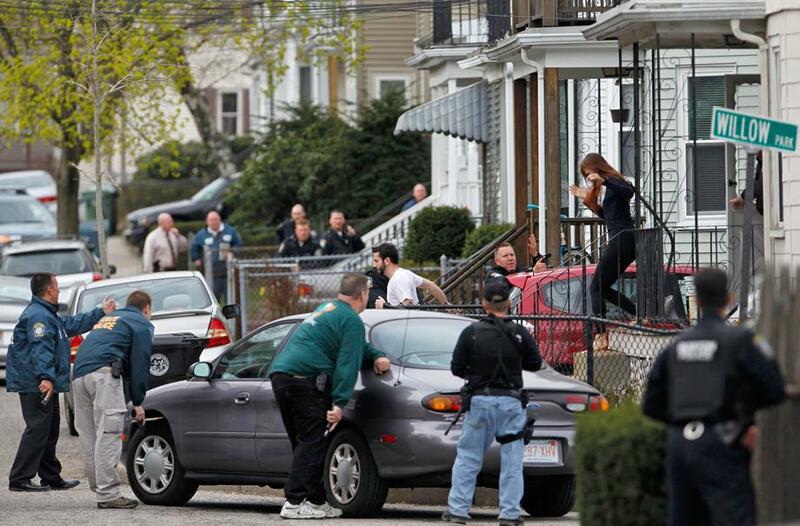 The tragedy of these acts is that the people of Boston accepted this violation of their rights. Some of us laughingly call Massachusetts as a “People’s Republic”, a reminiscence of the Communist governments of East Europe. Welcome to the new “progressive” disunited states where the government decides what rights, if any, you may have. Mayor Bloomberg made this statement. New York City Mayor Michael Bloomberg believes that the Boston Marathon bombings have created a unique scenario — one in which traditional interpretations of the U.S. Constitution must change. Rather than shying away from cameras and other security mechanisms that some view as infringements upon individual privacy, the politician claims that the most recent attack calls for a new paradigm. As for those who fear government intrusion and express serious concerns about how these technologies and other policies could impede privacy, Bloomberg is sympathetic — but only to a point. That—is the view of the left. Whenever the Constitution prohibits some act or desire of government, whether it is freedom to travel, to be secure in our homes, or to our right of privacy, the needs of government must prevail and the Constitution be damned. I’m still waiting for the citizens of Boston and Massachusetts to protest these arbitrary acts by their governments. It’s been nearly a week. I’m still waiting.